Ok so I work for the studio that made The Secret Life of Walter Mitty. So right upfront you’d think I’d be biased towards the film. Well working for Fox has nothing to do with it. I really love every second and every frame of this movie. To quote Sophia Grace, it is SOOOO good. The cast, the acting, set design, cinematography, dialogue, etc etc etc are great. The story is wonderful and inspiring. One of the through-lines in the film is this cake. At the beginning of the story, Walter’s sister Odessa delivers him one on his birthday. His favorite. Made by his mother (the wonderful Shirley MacLaine). Later in the story the cake comes up again relating to Sean Penn’s character (who is perfectly cast), Sean O’Connell who is the impetus for Walter to go on an adventure. Walter takes this cake with him. This really is a unique cake. It’s flourless, gluten free and has whole Clementines in it. Skin and all. It’s super easy to make and is delicious. Based on the Nigella Lawson recipe. This entry was posted on Sunday, December 22nd, 2013 at 14:13. It is filed under Food, Uncategorized and tagged with cake, clementine, clementine cake, gf, gf cake, gluten free, gluten free cake, movie, Nigella Lawson, no gluten, Sweet, Sweet Things, walter mitty. You can follow any responses to this entry through the RSS 2.0 feed. It really is an amazing film! And the cake is the same! I love this cake. I’ve made it several times now and every time it tastes great. Tonight I’m trying honey tangerines instead of clementines. I think it will be great. I have a question. Although I have made it several times, it always comes out looking great, but by the time it is cooled, its low in the middle. Does anyone have any ideas as to what I am doing wrong? I’d like to make a pretty one, at least once. There are a number of reasons why this cake could sink in the middle, not sure which one applies to this version of your cake. 1) Too much moisture. Maybe the measurement of the clementines was off or the eggs were larger? 2) Opening the oven during baking or oven temp was off. Make sure the oven is pre-heated before baking. 3) Old baking powder. 4) Too much baking powder. 5) Overbeating the mixture. Good luck with the tangerine version! My daughter and I made this cake a couple of years ago and it was so bitter we couldn’t eat it. What did we do wrong? It turned out just beautiful! We microwaved the mandarin oranges rather than boiled them. It has become a great joke in our house, so I want to remake it right! Thanks for your help! Mary Lou! It’s not an overly sweet cake but it shouldnt be bitter. I also microwave my clementines. Maybe the type of fruit you had made it bitter? Next time try a different fruit and maybe that will make a difference. Sorry to hear this. Don’t give up on the cake! 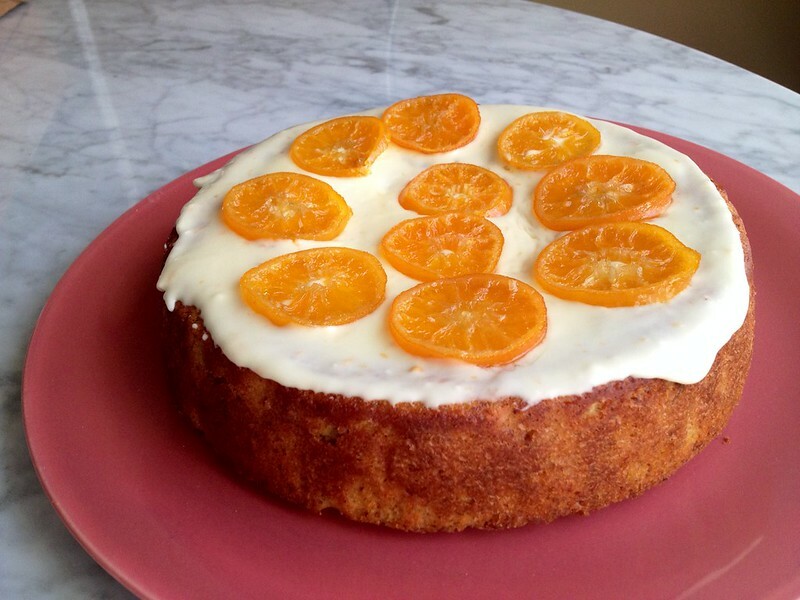 Can this cake me made using Mandarins? Yes. Clementines are mandarines (the smallest version). Tangerines, Halos and Cuties are also considered mandarins. Good luck! Why must it be made in a springform pan? Can the recipe be doubled and made in a 9 X 13 pan? I am asking because my future grandson-in-law would like this as his groom’s cake. Very good question. I think the ease of getting the cake out of the pan is why a springform pan is used. I have never made it in any other type of pan so I cannot tell you if there are any issues. I’m sure the cake will come out find. I suggest you practice with the doubled recipe in a 13×9 pan and see if there are any issues. I’m sure there will be no shortage of people wanting to try the practice cake! Good luck and congratulations! This recipe lends itself very well to some modifications (to suit your taste). I did not use a springform, but I did add in a few splashes of whipping cream (milk = that creamy consistency I was after!) along with some flour to bind everything a little better (probably 1/3 cup each, possibly more flour). The batter was similar to normal cake batter in appearance when pouring it (maybe slightly runnier), and I used the same baking time. This made for a lovely, dense, and creamy texture! My two 9″ round pans fit the amount of batter very well. And they fell out of the pan perfectly with simply greasing it first. I believe one 9×13 would work well if you add in some flour/milk also. It should be a thinner cake to allow the eggs to set properly. I also added in vanilla & salt as recommended below. As a rule, chefs say you should always incorporate multiple elements (sweet/salty/sour) to get a well-rounded flavor. Lastly, I felt that it was too bitter with all of those peels. Next time I will peel 3 of clementines beforehand to reduce the bitterness. I mean, people add zest all the time, but it seemed like overkill. Also, I dont want pesticides & dyes from the peels (many growers even dye the skins! )… Lastly, I used my toaster over to bake/roast my clementines (covered, cut sides up for almost an hour) instead of microwave. Slow cooking deepens flavors. A final thought: after blending up your clementines, TASTE THE MUSH! Dont be scared! If it is bitter, then your cake will be bitter. You can always toss your “mush” into a small saucepan and cook it down further with a bit of sugar until the flavor mellows to your liking. I love Walter Mitty! This is a cake of reverence for me! I used a basic round pan with no issues! The Clementine’s who make the cake so moist that as long as you grease it, it won’t stick! Hi there – I’m a novice baker so a silly question but should I be using caster sugar or just normal granulated sugar for the cake recipe? Thanks!! Louise, for the cake you would use normal granulated sugar. The glaze/icing calls for caster sugar. This is a very easy cake to make for a novice. Good luck! Great thank you! We love the film and my all my husband has asked for his birthday is this cake!! So no pressure at all ha ha! I will re-post how I get on! Thanks again. Can this be made without the ground almonds? My husband is allergic to tree nuts. Any ideas for a substitute? This may seem crazy but maybe ground pretzels? My sister has a tree nut allergy and we do this for her and it tastes pretty good. I made the cake twice this weekend. Once as described, but with a sweet cream cheese “glaze”, once in a vegan version with a milk-free margarine based glaze and No-Egg egg substitute in the batter. Both of them delicious! Thanks! Hello! I want to make this recipe vegan, what egg sub did you use? Did you use flax seed or store bought? Thank you! Hi! Is there a reason to butter the pan AND place parchment paper? I follow the instructions, but was just curious. Also, does the parchment paper need to cover the sides as well, or can I just cover the bottom of the pan? The parchment paper folds in some spots and the cake comes out “dented” in spots. Love this recipe! I’ve made it two weeks in a row, once a week!! You don’t really have to butter the parchment paper once its in the pan but – just an extra measure to make sure nothing sticks. Parchment paper only needs to go on the bottom but be sure to butter the sides of the pan. Thanks! This cake has amazing aroma! I would like to add that it is benefited by adding 1/4 teaspoon of salt and 1 teaspoon of vanilla. Hello Cathy, I was wondering if you could contact me about more info on the cake. I have a YouTube channel called Rheann.tv and am wanting to do this recipe for my channel. I would love to incorporate you in there somewhere for the video. First, thnks soo much for the lovely recipes! And all those commentors above thanks for all of you lol Every commentary was helpful. Oh by the way, do I just leave the cake… after baking .. to make a cake creamy like in the movie? Am I correct? In the movie the cake looks almost creamy.. no crumble at all. Is there any way to make it that texture? Or was that just a camera trick?! If you let the cake sit, covered, for a day or two it compacts and isnt crumbly. If your family will leave it alone for a “day or two” 🙂 Mine won’t! My husbands all time favorite move and cake. little involved but it’s a family favorite. So much so, that my 7 year old son, who loves strawberry cupcakes more than life, requested clementine cake for his birthday today. And I happily oblige because I’ll take any excuse to make this fabulous cake! I know it is probably in the recipe somewhere, but, do you pour the water off the clementines before you place them in the food processor? What water? It just says to microwave 3-4 minutes. You do not need to add water to the clementines if you use the microwave method – and no draining is needed after their cooked. The other cooking method is stovetop where cook the clementines in water on the stovetop. If you use the stovetop method you need to drain the water first before putting the clementines in the food processor. I recommend the microwave method since the clementines retain their juice and the flavor is not diluted. Thanks for clarifying! Just made it last week keeping in mind some of the helpful info from others’ and your responses. It came out okay, I thought just by looking at it, until my family tried it and they raved about it! I enjoy it, too, plus my husband and I love the movie ‘The Secret Life of Walter Mitty”. It inspired us on our Oregon PCT backpacking trip! Thanks for the recipe! This is my second attempt at this recipe, and it has come out fabulously each time! My favorite part is that it is naturally wheat and dairy free – absolutely no substitutions required (except for buttering the pan ;). So much fun to make! Thank you for sharing. Walter Mitty is our favorite movie of all time! I was really happy to find this recipe and it turned out awesome! I didn’t add any glaze or candied clementine to mine as we liked it just plain – it’s so moist and light! I’ll make it again… probably next time we watch the movie! Thank you! Great to hear Karen! Agreed that it doesn’t need the glaze or candied clementines – it’s really great on it’s own. I was so excited to make this and so disappointed with the result. Leaving the peel on the clementines went against my judgement and the cake was too bitter/tangy! Think biting into orange peel- it did not taste like marmalade. And I used good clementines in season. It is expensive to make with the almond meal too so it was disappointing that we had to throw it out.i will give it one more try without the peel. Well the whole point of this cake is that you use the peel on the clementines. You probably didnt cook them long enough as cooking mellows the flavor and makes the peel very soft. This cake is amazing! I’ve made it so many times; at this very moment I’m making two batches–making small loaves that I’ll freeze, to put in this year’s Christmas baskets. (These are way better than fruit cakes !) I’ve done this before, and even the candied clementine slices on top hold up very well when defrosted. I do add the glaze because it’s so darn delicious, and it helps the candied clems to stick. It’s true that baking times vary widely. It’s better, I’ve found, to slightly overbake if in doubt. Because there’s no flour at all, it doesn’t really dry out ( and it’s true that it’s even better as it sits. If you don’t eat it all within 5 days or so, you can wrap slices individually in seran wrap). I liked this so much that I brought slices in for two of my students who have Celiac disease–they loved it. The recipe is pretty forgiving. I use 6-8 reg sized clementines and one cup of sugar (I like it just slightly less sweet since I put the glaze on top). If you can find the tiny clementines to use for candying, they’re perfect. I’d suggest boiling for the 2 hours and not microwaving them. The point of the boiling is to rid the peels of any bitterness. And it makes the house smell nice. Finally, after you’ve candied the clementine slices, save that delicious syrup & use it for clementine martinis (1 part vodka, one part fresh clementine juice, a tablespoon or so of syrup [to taste]. Shake together with ice, and enjoy!) So, you can guess that my Christmas baskets are clementine-themed this year! I saved the syrup from the clementines and added coconut and macadamia nuts made brittle out of it. Delicious! Excellent recipe. I’ve made it twice following the instructions exactly and it turned out perfect both times. My Dad absolutely loves it! The whole family really enjoyed the movie and I’m excited it brought this great, new, gluten free recipe to our attention. Thanks Cathy! Thank you Sarah! I love the cake as well. It’s easy to make and very tasty! Hi! I absolutely love The Secret life of Walter Mitty and its probably one of my favorite movies of all time. I watch it all the time so I have really been wanting to try out this recipe. I just have one question: is this the actual recipe used for the cake in the movie? I don’t know what recipe they used for the cake in the movie but this is basically the same cake. Good luck! Turned out great for me, I just kinda sprinkled the glaze on , and you can just do Clementine slices , I don’t think they even need to be candied at the end. I used almond flour/meal and had no problems , good luck ! It is much darker outside and inside.Did you use home made ground almonds or a ready made almond flour? How did you make the glaze so white when the juice is orange and the butter makes the glaze light yellow? I have made this cake twice. The first time I did not glaze but used as is and it was delicious. Tonight I intend to glaze it just to see the difference. I used the almonds without the peels that look like white match sticks (don’t know what they are called and the package just says almonds). I ground them in the food processor. Also I did not use the microwave but used the Nigella Lawson method of putting 5 clementines in a large pot and covering with cold water. When the use water started to boil I turned it to simmer and let them simmer for 2 hours. Then drained them and let them totally cool. I don’t think it makes much difference which method you use. The ingredients and measurements are exactly the same. Nigella does everything in the food processor but this recipe just does the clementines in the food processor and the rest is done with a mixer. I have now done it both ways and prefer the method in this recipe over Nigella’s method. Also the cooking temperature is the same but the cooking times are different. I just check it after 40 minutes and do the usual tests for doneness. My cake turned out to be total disappointment 🙁 First of all it is much darker, but the reason could be my almond flour – I bought ready made flour and it was as dark as brown sugar. I could not find any clementnes here in my country at that time of the year and I used two large oranges. I am also curious how your glaze is so white. I used 1/3 amount of the orange juice advised here, less butter and all the amount of the confectioner sugar which means if I add the rest of the juice it will not be so thick to spread it on the cake.The amount I have now is also a problem – I think it will cover at least 3 cakes if it is so thin as per the picture here 🙂 The glaze itself is yellowish as well because of the orange juice I think. The butter itself is not pure white too. Anyway, I hope next time the result will be much better 🙂 Best wishes! I am so sorry to hear this! I use ready made almond meal. It was very light in color. It’s amazing how the smallest changes in ingredients will affect the results. Please do try again! What about the glaze? How did you use that recipe and still get it soo white and that thick as it looks in the picture? The glaze probably looks really white because of the lighting. IRL it’s not that white. Again… so do you use the same amount of almond meal or does that change??? Same amount. Almond meal is just ground almonds. Wow! A treasure trove of comments! Several months before I saw the Walter Mitty movie in the theater (the landscape scenes knocked the socks off both my hubs and me!) a neighbor gave us a few recipes he told us were delicious and fast, easy and cheap. One was a clementine cake. 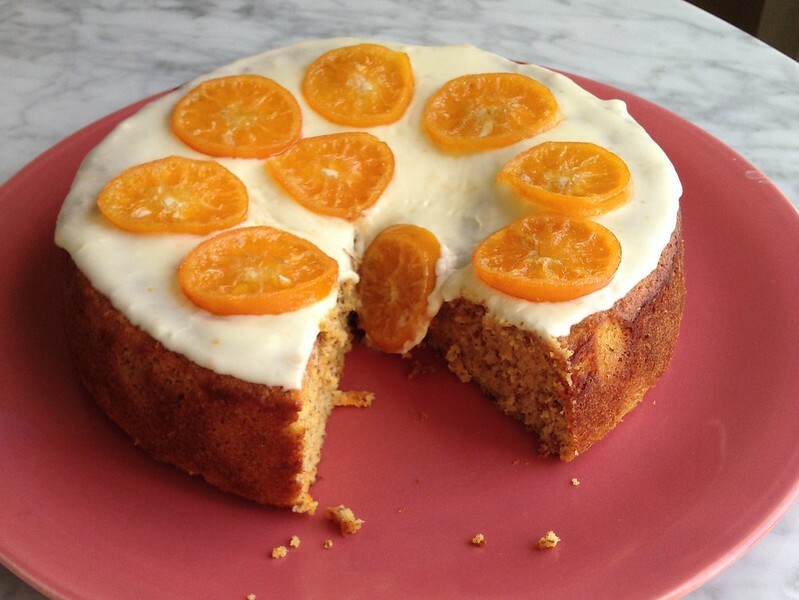 It seemed interesting, and since I’d never heard of a clementine cake I wanted to make it. I couldn’t find any though. I thought they were ubiquitous, like oranges or celery. So, I went home and quickly forgot all about the cake. After hubs and I saw the movie in the theater, I bought the DVD and have watched it a bunch of times. When hubs brought home a big bag of clementines, I remembered that recipe the neighbor gave me. After fruitless searching, I decided to google it — and here I am!! I’m going to make the recipe but I’m going to try using the four inch pan set I got for another recipe. I’m hoping it works; I could probably eat the whole nine inch cake by myself, not a wise choice, but, if the four inchers work I’ll share with the neighbors and spread the happiness. I’ll let you know how it comes out! Bonne Chance! My husband and I are huge fans of the movie… My husband loves it so much that he watches it every few months. He’ll be watching it soon to get him in the mood for his upcoming three week motorcycle adventure. I really want to make him this cake for the night before he leaves. However, there are no clemintines where I live–we only see them around Christmas time. Is there something else I can use, like tangerines or oranges? Thank you Cathy! I’m going to make it in a week and a half and I’ll come back to share my experience! I was able to buy clementines for the cake, despite the season. It turned out amazing! I followed the recipe exactly and it was lovely. My husband is already asking when I can make it again. I had my doubts but this cake, no word of a lie, is an amazing cake. So much flavour, so moist and I did not make any changes to it. It has to be one of the best gluten free cakes I have ever made. Truly deserves a rating of 10+ out of 10! Thank you!!! Thank you Dora. I could not agree more! Hi Cathy! I cant wait to try this recipe! However, we don’t own a microwave (yes, intentionally). I assume I could steam or bake these (covered) instead? Thanks so much! No microwave? Good for you! I broke down and got one about a year and a half ago. The best way to cook the clementines would be on top of the stove in a covered pot with water for about 45 minutes. Drain well. Good luck! I made the cake last weekend and have to make another one today! My family really liked the cake and wants another one. I just bought fine ground almonds in the baking section at the grocery store. I would advise using half of the amount of glaze as it could be overly sweet. Either way, it’s very yummy. Pre-bought is fine! I buy mine from Trader Joe’s. Was just flicking through the channels and came across Walter Mitty. I’ve never seen the movie, but from these comments I must next time it comes on. I’m dying to try this cake. I have a daughter that is allergic to nuts, is there an alternative to the recipe? Firstly, you really need to see the film. It’s fantastic and inspiring and beautiful and the music is incredible. As far as an alternate to almond meal, you could use wheat flour but the cake will not be as moist. But it should work. I use ground rice instead of ground almonds. The cake turns out brilliantly. If you want to, you can add almond flavouring (if not directly from almonds) or just add vanilla extract for flavour. We are nut free in our house but still enjoy a tasty Clementine Cake. All the best! After seeing the movie I had to make this cake. Maded it for our weekly family supper and it was GREAT!! Anyone tried to glaze cake with cream cheese instead of sugar? I think there is a typo in the glaze as it calls for “1/2 cup clementine juice” when it probably should have said “juice from 1/2 a clementine”. Our glazed didn’t come out white or as thick looking as the picture either. You have to adjust the liquid and the powdered sugar to get to the right consistency. Air humidity makes every version different. Thank you so much for posting this. Walter Mitty is my son’s favorite movie and we feel as inspired by it and as fond of it as you are. We decided to look and see if there was a recipe for the cake so that we could start a New Year’s tradition of making this cake to remind us of the movie, the character and the message. We were thrilled to find your connection and recipe! Hi! I saw the movie ( And loved it), and it reminded me that I had printed it out about 10 years ago, after seeing Nigella Lawson on Good Morning America…but had forgotten all about it without actually making it! So I actually found my original recipe but wanted to ask if it could be made without the peels since they’re not organic (since I think it’d be a little healthier). I do have some organic orange peel I can add. Would that work, and if so, do you think I should boil the clementines for less than 2 hours? I wouln’t make it without peel. You could substitute orange peel but part of the flavor and texture of the cake is from the peel. I’m sure you can boil for an hour and it would work. Just remember to drain well. Thank you so much for sharing this. I adore Secret Life and thought Ben Stiller did such an excellent job, the whole thing has such a good feel to it and it’s lovely to hear it was like that on set too. I’ve been thinking about that Clementine Cake for months and I’m stoked its GF and movie authentic! Okay, this may sound like a silly question, but do you leave the peel on the clementines and then put them in the microwave and then blend them peel and all? That boggles my mind a little bit so I am just asking for clarification. Thanks! Is there any way that one could use a mixer or blender rather than a food processor? Thanks!! I am a huge fan of this movie (I have memorized every line) and I, myself and a photographer so I can relate. I have been looking for a recipe for this cake forever, and I finally found the perfect one!! I look forward to making this cake! you can try to chop the clementines in a blender. I’m sure it will work. I LOVE that you had first hand experience with this movie. It is so incredibly wonderful!!! And I LOVE IT that you’ve provided this simple and beautiful recipe! I just told my hubs today that I want to buy this movie so I can have this sweet inspiration whenever I need! And the cake when I need it too! Peace, love, and bright blessings to you!!! This is how you spell Shirley MacLaine. Is it too late? Does anyone know if you can substitute mandarin oranges? I’ve never seen a clementine up here in BC, Canada. At least where I am at! Really want to make this! I think mandarins will work perfectly. Clementines are a cross between mandarins and oranges so they are very similar. So, my almost 3 year old is obsessed with The Secret Life of Walter Mitty. We watch it almost every night. Her birthday is Nov 1 and my husband and I thought it would be cool to give her a Walter Mitty themed birthday. We don’t really believe in parties for super little kids so we aren’t having a blowout but we will be having our parents and siblings over. We would love to do the cake and are trying to think of other special things to do that day. My daughter is a sporty girl so a skateboard and remote control helicopter are just some of the ideas we have but I would love to pick your brain. If you would be so kind as to respond here or e-mail me directly I would REALLY love it! Since the essence of the film is about Walter getting out of his comfort zone and finding himself you could do a scavenger hunt just for her. Each found clue would have a gift and another clue to get to the next clue. Just an idea! Oh and the cake would make a great birthday cake! Cathy! That’s an amazing idea!!!! I love it. Thank you so much. I am excited about the cake – not sure I can hold off until November to make it. I didn’t realize it is flour free. Now I love the idea of it even more because I try to be gluten free as much as I can. Thanks again for your input – I love your blog!!! This cake was delicious but a tad too sweet. I didn’t have a springform so I used an 8″ round cake pan and the middle was slightly underdone but the top was brown. The almond cake itself was super delicious but next time I will reduce the sugar or substitute milk for the juice in the icing to contrast the flavors and cut the sweetness. Other than cloyingly sweet, it’s a great recipe that would accompany coffee or tea well! This is most certainly a hit! It was really fun to make as well. I just recently purchased a vitamix, so the preparation was significantly cut down. Thank you for the wonderful recipe, I will be using it for a long time. I love this movie. The fun part was having the movie come out when we already had a trip planned to Iceland. The second fun part was watching the movie on the in-flight entertainment on the way to Iceland. Now I just got the DVD for Father’s Day. I love the extras. The only thing I would have liked would have been a director’s commentary track. Thanks for the recipe I’ll have to try it! the cake sounds really awesome – will have to try. must say tho i much prefer the original movie.. Danny Kaye will always be Walter Mitty to me. Great idea in reducing the sugar. I will try that next time I make the cake. Hello, loved the movie and I seriously want to try this cake! Only problem is that clementines are no longer in season 🙁 Can I substitute tangerines for the clementines? Yes! You can substitute. They are almost the same fruit so I’m sure it will taste great with tangerines! I didn’t see the movie in the theaters but have watched the DVD half a dozen times so far. I agree it was cast well and all the characters fit their rolls. Really great movie IMHO and the humor was fantastic. By the way I found this website via Clementine Cake. Made the cake today and it was fabulous! Thank you :). We love the movie and have an abundance of tangerines on our tree! Thanks for the Trader Joe’s tip. Almond Meal was $12 at Whole Foods versus $5 at TJ’s. Yes, the TJ’s almond meal is the best! This looks lovely, but I have a couple of questions about the almonds. I apologize in advance for being dense. First, the recipe calls for 2 1/4 cups ground almonds, so the almonds should measure that amount after being ground…any idea how many almonds that is (3 cups, 4 cups?)? Second, are these raw, skinned almonds? Just made this and it was the best cake I’ve ever baked! It took two 6 oz bags of slivered almonds, ground, to reach 2 1/4 cups. I might try to cut back on the sugar a little just to push the calories down- because I could not stop eating it!! My colleagues have appreciate the cake. I will tell you when it will be published. Personally, I made the cake without the glaze, because it’s too sweet. Yes the glaze is very sweet but it looks pretty! I completely adored the movie (saw it 7 times in the theater, a record for me) and was really curious about this cake and excited to find a recipe that didn’t seem too complicated… I actually have made it twice now; the first time it was good, but not fantastic, and I realized that it was because I was using somewhat bitter clementines. I made it a second time a week later with sweeter ones and it came out beautifully. I actually couldn’t believe how good it was. The fact that it’s gluten free is a huge bonus, too! Thanks so much for posting this recipe! I absolutely loved the movie and the minute I finished watching I started digging the web searching for a recipe for this cake I never heard of before. I just made it and I must say I’m astounded how quick, simple and full of flavor it is. Thank you! Saw a newspaper (Stamford (CT) Advocate) on this cake and thought I’d give it a try since we had plenty of Clementines. Very simple to make. Smelled and tasted delicious, especially with the glaze. Thanks for sharing. Question: The original recipe calls for simmering the clementines in hot water for 2 hours (you microwave it). What’s the purpose of doing that? I thought by boiling the Clementines there might be too much moisture in the cake. Turns out the microwave method worked perfectly. I made this with flour and 2 tsp almond extract and it came out too heavy. I made it a 2nd time just as directed and much better. Tastes like marmalade. thanks for sharing this recipe i loved the movie. Thank you for posting this recipe! I saw the movie, loved it, and needed to try the cake. I was mainly worried that the movie had hyped it up too much, but it was so perfect! It was made even better since I was able to share it with my gluten-free parents! The Secret Life of Walter Mitty captured my heart almost immediately. My husband and I saw it on New Years Day and could not have imagined a better movie to set the tone for a great new year. It’s a fantastic film on its own but the amazing soundtrack just sets it over the top. Walter Mitty has quickly made its way into my top 10 favorite movies of all time. Also, my hubby’s been asking me to bake him clementine cake ever since so we’ll see; it’s in the oven right now. I saw the movie today. I was hesitant to go because I adore the Danny Kaye version, but my sister recommended it, so I went. I love it. It is charming, fun, and uplifting. Not to mention adventurous, brave and creative. Bravo to everyone involved in making it. I just saw the film last night and LOVED it – I was also curious about trying out the cake, which I have never heard of before seeing the movie. Since I have a tree in the backyard, it seems like a great way to utilize the fruit. The candied slices on top are a delight! Thanks for sharing the recipe! Do you know if I can substitute the ground almonds for cake flour? I haven’t tried it but I would use 3 eggs, 2 teaspoons of baking powder and add 1/2 cup of butter. I tried this method too, but added more water as the batter was too thick. I liked this one the best as it tasted more like tangerine bread. Can you be more specific about now you made the glaze? I tried mixing it together but gotta e with clumps of butter floating in it. The cake is delicious, though – and thank you for the microwave tip. I’d never have made it if I had to boil them for two hours! Oops – meant “got a glaze” not “gotta e”! The butter has to be real soft, not melted. You can mix with a spoon or if you want you can use a mixer. This is just basic butter cream but with less butter and more liquid! How did you get it soo white? It looks whiter in the photo. It’s not pure white. any suggestions on what to do with the clementines if you don’t have a microwave? I live overseas and don’t know anybody who has a microwave 😉 thanks!! so excited to make this cake!!! The original recipe calls for the clementines to be boiled in water for 2 hours, then cool and dry them. I don’t normally cook with a microwave oven but in this case the cake is less “wet” but the boiling technique works! I just watched the movie for the second time! It really is THAT good. And that cameis such a constant theme, I have to try it. From Iceland to Afghanistan, Clementine cake looks like a winner! Thank you so much for posting this! My daughter and I saw the movie last night and loved every minute of it. My daughter is 15 and she said the movie inspired her to seek out an adventure. It inspired me to want to encourage her towards adventure and to bake this cake. We eat clementines by the pound this time of year and are so grateful for another way to enjoy them! Cheers! My wife and I saw eh movie on New Year’s Eve, and the Cake caught my attention I think it’s perfect. My wife is leaving town for the day tomorrow and this is just the right project for my 4 year old and me to make for her. She is a gluten free eater, can’t wait!! Thanks again! i just saw the movie and came right home to look for this recipe just to find out that i have eaten it before. this is very popular in Spain. it is made slightly different without the frosting but with candied oranges and cherries, and the taste of sugar is not overwhelming. I had to google ‘clementine cake’ after watching Walter Mitty last night and craving it ever since I saw it on screen! I will be using this recipe in the very near future and give it a try. The pictures looks amazing! Thanks. Great! It’s really easy to make and tastes delicious! Hi Cathy, Do you peel the clementines (that go into the cake) or do you process the peel and all? Thanks. This cake uses the entire clementine – peel and all. So, no you do not peel the clementines process the entire thing. In the end it’s sort of like using marmalade in a cake. Thanks for posting this. I agree with your points about The Secret Life of Walter Mitty. It is an absolute brilliant gem of a movie and the cast could not be better. The cake stole a few scenes and piqued my interest. I will make it for New Years! Great pictures! I have an italian blog that matches movies and recipes.. I’m working on a post about the secret life of walter Mitty and I’ll link you. See you soon!! Great blog Diana! Looking forward to your post on Walter Mitty! Here you are! http://www.nonsolopizzaecinema.com/2014/01/la-clementina-di-walter-mitty.html See you soon! Oh my gosh I wish your blog were in English! I love the idea of creating recipes to match movies. I could see myself doing it. I was also trying to decide how I might make the cake and here was my idea: I imagine the vanilla cake has cardamom in it, the clementines have been boiled in syrup to candy them, and the frosting is vanilla with vanilla bean flecks. I like that all the recipe versions I have been finding involve the use of candied clementines. I went to the Italian website and Google offered to translate it for me, so I clicked “translate” and it is now in English….try it! I can’t wait to see the movie. Love the clementine on this cake. Do you leave the peel on the clementines? Yes, you cook and chop the clementines peel and all. The peel has a lot of flavor and oils and adds a lot to the cake. Thank you, I will try that and let you all know how it tastes.